Legit® is a true mineral, not just a glorified salt, and its powerful aroma will attract deer from far and wide! There are many mineral products, but most are glorified salt. 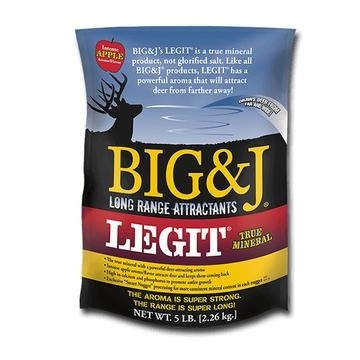 Of the few "true" minerals, only one is also a long-range attractant – Legit from BIG&J. The intense apple aroma and flavor will draw deer from far and wide. The high calcium/phosphorus content promotes antler growth and meet the deficiency in the natural habitat. Legit® includes trace minerals that are essential to reproductive function and healthy bone growth/antler growth.